These Keto Spicy Artichoke Dip Jalapeno Poppers definitely raise the bar. They are an easy, delicious, one-way ticket to an incredible flavor adventure that you won’t want to come back from anytime soon! Preheat Oven to 400. In large bowl place chopped artichokes and cream cheese. Microwave for 30-45 seconds until cream cheese is melted. Mix. Add mayo, onion, cheese, chili powder, garlic and desired amount of salt. Mix until combined. Cut jalapenos in half and remove veins and seeds. Rinse. Place about 1 tablespoon of dip mixture into jalapeno. You may need slightly less for smaller jalapenos. Wrap each stuffed half with bacon and place on baking sheet. 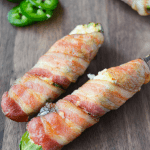 Bake for 30 minutes until jalapenos are tender and bacon is crisp. You may need to reduce time if using smaller peppers or thinner bacon. Check oven after 15 minutes to determine how much longer yours need to cook. Jalapenos were about 4 inches long by 1.5 inches wide. You may need more if yours are smaller. Since I used larger peppers, my cook time was 30 minutes. For smaller peppers or thinner bacon, you may need to reduce time by 10 minutes. Check at the half way point and determine how much longer yours need to cook. If you decide to make dip alone it easily doubles and freezes. Nutrition is for ONE serving of 1 bacon wrapped popper.